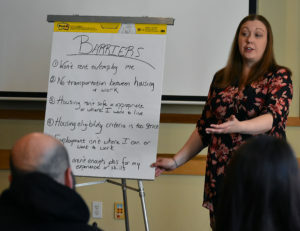 We held a meeting with the Michigan Coalition Against Homelessness at the Heartside of Michigan United Way in Grand Rapids and each of our meeting guests took a few minutes to tell their stories. There was a 25-year-old young woman who had been in and out of prison on drug charges, and now needed to find a place to call home. But the landlords she approached told her that they wanted to see five years lapse between her release from prison and her rental application. “How can I have that when I’m only 25?” she wondered. There was a man who had a background in social work just a few months shy of completing his next college degree. He ended up serving a seven-month jail sentence following a family dispute that turned violent. His family has since reconciled and forgiven him — something he is incredibly proud of — but the rest of society won’t give him a second chance. All of these people came with a story to tell. 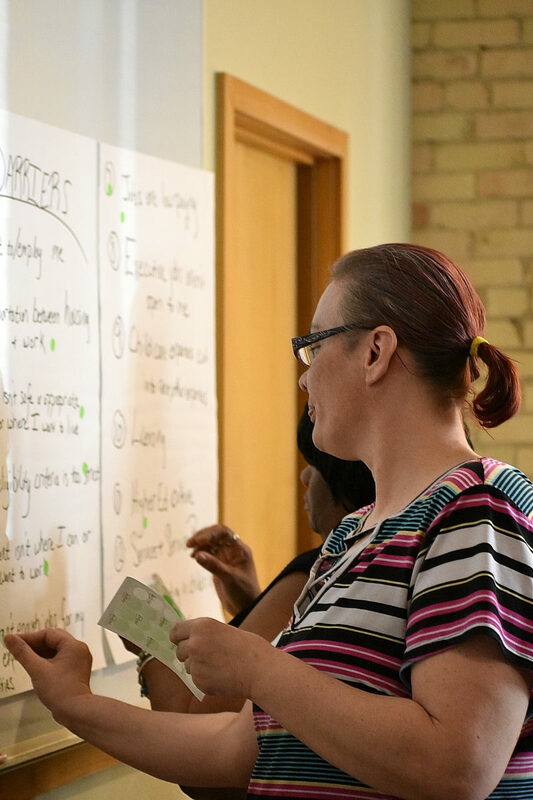 The purpose of the workshop was to coach them on how to use that story effectively, so that their experiences advance reforms like the Clean Slate initiative. Clean Slate is a policy proposal that would automate the expungement of criminal records, making it easier for people who have been involved with the justice system to get a fresh start by obtaining good jobs, admission to college and trade schools, and safe and affordable housing. Story-telling coach Amy Phillips helped guide the participants through a series of exercises during the morning session. In one of them, she asked the participants to complete two sentences: I am ____, and I want ___. The answers the participants gave were profound. “I am God’s child,” said Barbara Thomas, the woman who has started the nonprofit. “I am not a ho,” said one woman who had been convicted of prostitution. She explained that when she walked down the street, she felt that people still saw her that way. She said that even her mom and sister thought of her like that. Many of them said that they wanted to be seen for who they are — not who they used to be, or who people assume they are. I asked them how it felt to make such simple yet deep statements in front of others. Powerful, I was told. Lansing: Friday, April 5, from 6-8 p.m. at the Letts Community Center, 1220 W. Kalamazoo St.
Kalamazoo: Saturday, April 6, from 1-3 p.m. at the United Methodist Church, 1009 E. Stockbridge Ave.
Detroit: Wednesday, April 10, from 6-8 p.m. at the Nazarene Baptist Church, 901 Melbourne St.
People will have a chance to put those story-telling skills to work on April 24 at a Lobby Day at the Michigan Capitol that will include press conferences, action and meetings with legislators. Being able to share your personal stories to illustrate the need for policy reforms such as Clean Slate can be a compelling and convincing argument when you meet with decision-makers, but meeting with influential people can sometimes be intimidating. If you can make it to one of these trainings, you can learn more about how to use your own life story as a powerful tool to mold public policy.